Zach Murray takes a commanding lead in the final round of the Australian Master of the Amateurs to sit at 11-under-par and two strokes ahead of Frazer Droop at Royal Melbourne. Murray, the 2014 Victorian Amateur champion, is the only player in this elite 78 player field, which includes four of the world’s top-10 players, to fire three rounds in the 60′s. Precision course management has seen Murray fire rounds of 69-69-67, which included an eagle today on the 15th at Royal Melbourne’s West Course. Jake McLeod, a former Queensland Amateur champion, fired a stellar round of 66 to move into third position three shots from Murray. McLeod has tasted success before winning the 2012 Golf SA Junior Amateur champion and in 2012 won the World Cup Team Challenge for Australia in Palm Beach, Florida. Ben Eccles, another exciting talent to follow, shares third position with McLeod at 8-under under rounds of 66-74-68. The Aussie pair are a stroke ahead of Cory Crawford and Andrew Schonewille, after Crawford fired a third round 69 to add to his opening rounds of 69-71, with Schonewille carding rounds of 71-68-70. Seven players are within five shots of Murray, including American Bryson DeChambeau who carded an impressive third round 66. 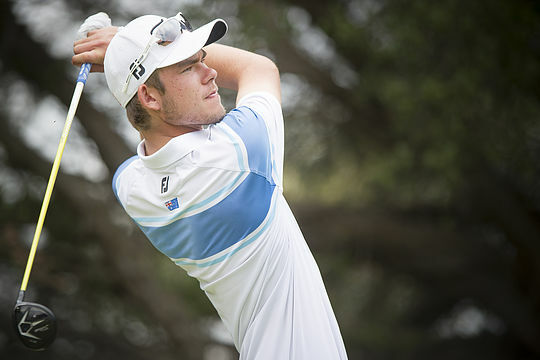 Cameron Davis fired an equal course record 63 for Royal Melbourne’s West Course to rebound after a disastrous second round 77 to be in 7th position. Davis recorded eight birdies and an eagle, blemished only by a bogey on the shortish par-five fourth when his tee shot went left into trees and forced a second shot just to be bumped clear. Davis is in equal 8th position with a group of five players, seven strokes from Murray. But this is Murray’s championship for the taking as his consistency and ball striking has been second to none this week at Royal Melbourne. Murray is due for a big break and what better tournament to make it than Australia’s highest ranked world amateur event with the Australian Master of the Amateurs currently is ranked the world’s 17th tournament according the the R&A. Royal Melbourne has delivered the perfect test of golf and this grand old lady never disappoints. The West Course rewards the player who thinks and Murray continues to play golf well beyond his 19-years and his strategy and ball positioning has been spectacular. Murray has talent to burn. As a sixteen-year-old he became the second youngest men’s champion with a gripping 1-up victory over the seasoned player Todd Sinnott at the 2013 Victorian Amateur. At last year’s Australian Amateur Murray progressed to the quarter finals with Sinnott gaining the upper hand in that match, yet along the way Murray accounted for Ryan Ruffels in the third round. This is what Murray is due for a big “W”. Yet it will not be easy as there are six players within four shots of Murray heading into tomorrow’s final round. It will be again a great finish to this event. Cory Crawford, who this week has been nothing but impressive and he has the swing to withstand back nine pressures on the final day. Crawford is just four behind and is hunting. Jake McLeod is also busting for a major breakthrough victory and his ball striking today was majestic and Frazer Droop displays the fighting qualities of a true bull dog.